Video management requirements differ depending on the number of cameras, performance requirements, platform preferences, scalability, and the ability to integrate with other systems. For advanced recording and event management, video management software serves as the core of professional video surveillance systems. The software is installed on a PC and can be an independent solution or a client/server-based application for multiple simultaneous users. From the software interface, operators can, for example, record video continuously, on schedule, on alarm and/or on motion detection or search for recorded events. A dedicated Networked Video Recorder (NVR) can be used to gather data streams from remote network cameras and video servers and store them on a hard disk. An NVR can be a standard networked PC or a dedicated video-recording hard disk server with a software application. Video management enables multiple users to view several different cameras at the same time, and allow recordings to take place simultaneously. Video management software can also increase the resolution for cameras with activity or alarms. The system can be utilized for different purposes and even different departments — e.g. 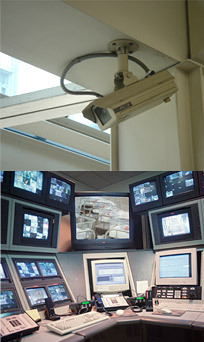 a store’s IP-Surveillance system can be used by one individual for security purposes, while another uses it for studying store traffic. Continuous, on alarm and/or video motion detection, and scheduled (which can combine continuous and on alarm recording instructions). Video motion detection defines activity by analyzing data and differences in a series of images. Video motion detection can be performed at the camera level, or reside in the software. The software can provide the motion detection functionality to network cameras or video encoders that do not have this feature built in. Parameters can be established so that alarms are not sent during hours of normal activity — for example, such as from 8 am to 9 pm, Monday through Friday. Therefore, if motion is detected at 3 am on a Saturday, the system knows that this activity is not normal — starts recording and can send e-mails or text messages to alert the proper authorities. Video management enables users to set the recording frame rate of selected cameras, and pre-determine that if activity is detected, the recording frame rate would increase, and if there is no motion, the rate would decrease. 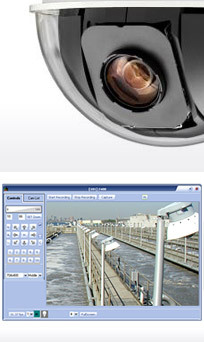 Video management systems allow users to administer and manage cameras from a single interface. This is useful for tasks such as detecting cameras on the network, managing IP addresses, and setting resolution, compression and security levels. 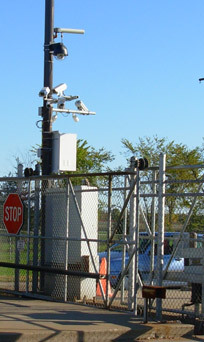 Cameras are often located in distant or hard-to-reach locations, making it impractical for the administrator to visit every location and individually upgrade every camera. Video management systems provide access to every camera on the network. Some video management software may also include full duplex, real-time audio support, as well as analytical tools that improve image details or provide helpful information to users. Video management software can be installed on a PC server platform. Most video management systems are available for the Windows operating system, but there are also options for UNIX, Linux and Mac OS. Open platform solutions run on off-the-shelf hardware, with components selected for maximum performance. The systems are fully scalable because cameras can be added one at a time, and there is no limit to the number that can be added or managed. They also make it easier to add functionality to the system, such as increased or external storage, firewalls, virus protection and intelligent video algorithms. Some video management systems use a web interface to access the video from any type of computer platform. Web interfaces allow video to be managed online from anywhere in the world, using the proper safeguards such as password protection and IP address filtering. Video management systems based on open platforms have another advantage in that they can be more easily integrated with access control devices, building management systems, industrial control systems and audio. This allows users to manage video and other building controls through a single program and interface. Integrating a video surveillance system with access control systems allows video to be captured at all entrance and exit points and for pictures in a badge system to be matched against images of the person actually using the access card. Video management systems also enable video to be integrated into industrial automation systems or BMS, such as heating, ventilation, and air conditioning systems. To do this, digital inputs and outputs (I/O) provide data to the system or the network cameras for functionalities such as controlling the heating or lighting in a room when it is not in use. I/O can be configured to record video or send alarms in response to external sensors. This allows remote monitoring stations to become immediately aware of a change in the monitored environment. An example of a video management software is the DETEXI Network Video Management System. DETEXI System is specially designed to manage network cameras and video encoders to provide multi-camera viewing, high-quality recording, alarm notification, multi-view playback and remote access capabilities. The software lets you monitor multiple cameras at the same time, and simultaneously, record video either 1) continuously, 2) on alarm and/or video motion detection, or 3) based on a schedule, wherein you can combine both continuous and triggered recording instructions. The software can also send alerts if video motion detection or an external alarm input is triggered. You can instruct the program to display a video pop-up, send e-mail notifications, or trigger an external alarm device. The software’s multi-view playback feature allows users to view simultaneous recordings from different cameras to get a comprehensive picture of an event. An events search function lets you search recordings for motion and activities triggered by external alarms. An event log can display a list of errors, while an audit log keeps track of all user actions. The DETEXI Video Management System runs as a background service on a Windows PC with XP Professional, 2000 or 2003 Server. This means that even when you’re logged off the PC that is running the software, the DETEXI System is still operating. The current version of the DETEXI NVR streams and records network video in Motion JPEG format. For optimized quality and bandwidth MPEG-4 and highly efficient H.264 video compression will also be supported in upcoming 5.6 release. Digital recordings are saved directly onto the hard disk(s) of the local PC server running the DETEXI software. On this PC, all normal operations, such as viewing, playback and administration, can be done. Meanwhile, a free DETEXI Remote Client can be installed on any PC on the same or outside the local network for remote viewing, playback and administration. This means that the server can be placed anywhere; for example, in the server room or basement. The DETEXI Network Video Management system is fully scalable. A base license is required to run the DETEXI Video Management System and allows for a specified number of cameras to be used with the program. Additional camera licenses, as well as software upgrade licenses, are available for purchase. Cameras and licenses can be added one by one and the system hardware can be expanded to meet increased performance requirements. There is no limit to the number of cameras that can be added or managed. DETEXI security installation has the ability to scale from small business use to enterprise level security operations. With a number of cameras sending information over a long period of time, the only way to deal adequately with the shear volume of files is to share the load over a distributed NVR network. NVR network consists of several NVRs that are logically attached to the main NVR — DETEXI NVR Domain Controller. it is indispensable solution for complex distributed environments and monitoring centers. Thus, it is possible to control several NVRs remotely from the NVR Domain Controller. Each particular NVR is responsible for its group of cameras and carries the task of recording, touring and alarming functions. NVR Domain Controller learns everything about the NVR’s in the NVR network and their group of cameras. The DETEXI Network Video Management system as an open platform system has another advantage in that it can be more easily integrated with access control devices, building management systems, industrial control systems and audio. This allows users to manage video and other building controls through a single program and interface. Integrating a video surveillance system with access control systems allows video to be captured at all entrance and exit points.